The Blood Red City, the second novel in the Never War Series, following the dramatic alternative history novel Suicide Exhibition. The story picks up not long after the events of the first novel and it's advisable you read this book before reading The Blood Red City. Where the first laid the ground rules of this 1940's alternative history, this book delves much deeper into the Vril / Nazi escapades and their plans for the world. The secret organisation Station Z is trying to find out what the Germans are up to and prevent them from doing it, while also looking for any artifacts before the other side get hold of them. The trouble is that the Vril are after them too — a complication both dangerous and worrying. There is a great deal going on in The Blood Red City, the characters get plenty of time to develop along with a great deal of action scenes and perilous situations. It's a fluid continuation of the story and flows straight from the first book without skipping a beat. The pace is fast and steady but it's this rich, rewarding story that really makes the novel stand out. I loved this idea of Nazi's mixing with ancient alien technology and the way the aliens themselves are described is genius. The style of the book and the voice of the author are strikingly different than most books I've read — its part thriller, part adventure and part sci fi but with a good dose of police-procedural style investigation too. I think authors background in writing Doctor Who stories has helped here — after all Doctor Who stories often combine elements like those mentioned. Regardless it works for the Never War series and especially well for The Blood Read City. Not only does the author provide a 1940's ambience but in many ways this "adventure" style lends itself to stories of that era perfectly — or at least how you would imagine them to be based on the older films that are set in that period. It's a book that I couldn't put down, I was mesmerised from first to last page. 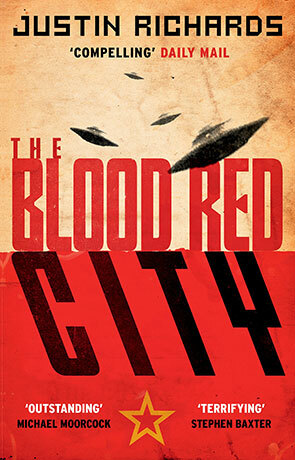 With plenty of action and a genuinely rewarding story, not to mention some great characters and suitably evil bad guys, The Blood Red City is a rewarding read and an almost faultless follow-up to Suicide Exhibition. Written on 25th May 2015 by Ant.